Tags: Christmas, 2017, Merry Christmas, Christ's Birth, Greater Fitchburg for Life To share or post to your site, click on "Post Link". Please mention / link to the Greater Fitchburg For Life. Thanks! Planned Parenthood is an abortion business. It does more abortions around the country and across the world than any other organization. The Planned Parenthood abortion company makes hundreds of millions of dollars doing abortions worldwide. And when there are big bucks to be made there’s really no reason to stop, even if it’s Christmas Eve and the world is preparing to celebrate the birth of the Savior Jesus Christ. At Planned Parenthood, abortions continue despite what the calendar says. Shawn Carney, the president of 40 Days for Life, talked about the sad plans Planned Parenthood has to abort babies pretty much every day of the year. “This Saturday is Christmas Eve. And for many Planned Parenthood locations, it’s just another day of business. And their business is abortion,” Carney added. “Many women experience deep depression on the anniversary of their abortions – no matter what day of the year they have it. But it’s unfathomable that such pain could be forever linked to Christmas,” he said. “But that’s Planned Parenthood – abortion, no matter what.” . . . View article & links. Tags: Planned Parenthood, Will Do, Abortions, Christmas Eve To share or post to your site, click on "Post Link". Please mention / link to the Greater Fitchburg For Life. Thanks! The Planned Parenthood abortion business is highlighting a letter from President Donald Trump to constituents and slamming his pro-life responses. But the majority of Americans, who are pro-life on abortion, will be encouraged. The president expresses his firm belief in the right to life of unborn babies. Trump then launches into a defense of defunding the Planned Parenthood abortion business. “As I have made clear, organizations like Planned Parenthood should not receive Federal funding if they perform abortions. 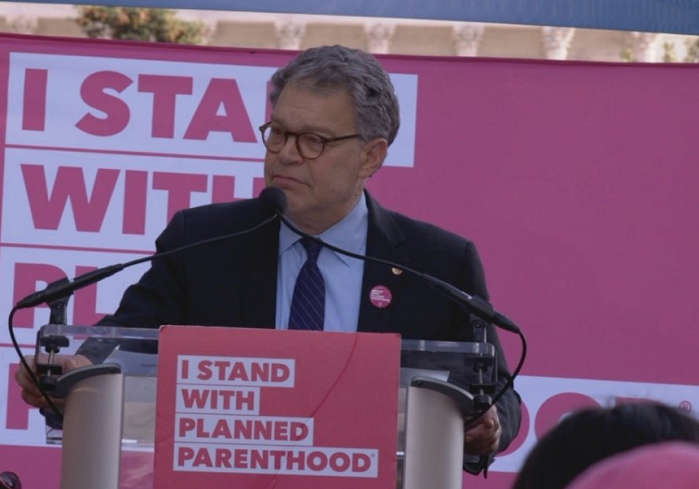 For that reason, I was proud to sign into law a bill that allows States to prioritize how they spend their Federal family planning grant money, including the choice to withhold taxpayer funding from organizations that insist on performing abortions,” he said. Read More. 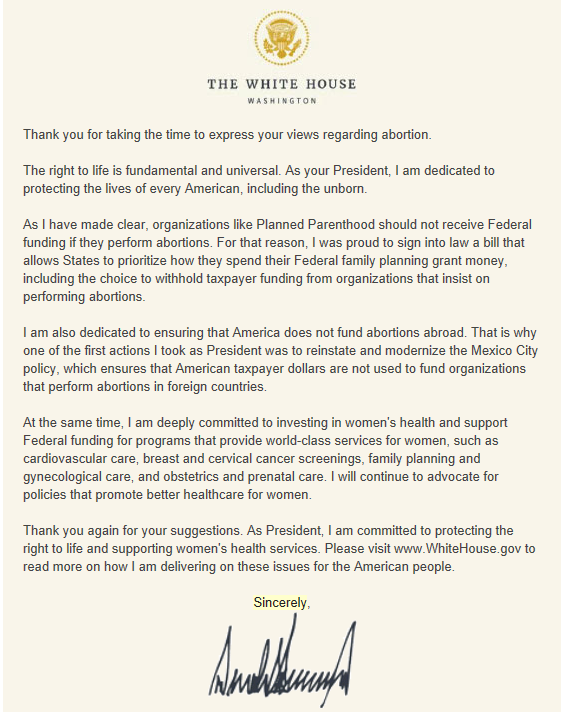 Tags: President Trump, Committed to Protecting, Right to Life, Defunding, Planned Parenthood To share or post to your site, click on "Post Link". Please mention / link to the Greater Fitchburg For Life. Thanks! by Stefano Gennarini, J.D., C-Fam: NEW YORK, December 22 (C-Fam) Of many bad moments for the unborn child and the natural family, five stand out in 2017. The Human Rights Committee in Geneva inched one step closer to excluding unborn children from the right to life in a draft legal commentary it discussed in November. Though not binding, abortion groups and their government and judicial allies will use the commentary to challenge and overturn legal protections for unborn children. The United States, Russia, Japan, Egypt, and Malta protested. More than 100 pro-life groups and scholars pleaded with the committee, including C-Fam [publisher of the Friday Fax] and Civil Society for the Family. The committee did not relent. The UN System joined an anti-American abortion scheme led by European activists in March after President Trump reinstated the Mexico City Policy. The U.S. policy strips abortion groups of U.S. taxpayer funds. It is so effective that European governments immediately pledged $200 million to bail out the abortion industry with the “She Decides” campaign. The UN Population Fund, UN Women, the UN human rights bureaucracy, and other UN entities led the conference that launched the campaign. Members of Congress will decide whether UN entities that challenge U.S. policy and mock the U.S. President should retain U.S. support. The world watched in horror as the young British family of infant Charlie Gard was denied the right to seek treatment in the U.S. last summer. Charlie was killed by doctors and judges who thought his life was not worth living. Worse, they plotted his death using the controversial “best interest of the child” standard to strip his parents of the authority to decide how to best care for him. According to this international human rights standard, the best interest of the child must be determined by doctors, judges, and government bureaucrats, not parents. His death will not have been in vain though. The horrific spectacle the U.K. doctors and judges put on was a wake-up call for parents all around the world. The UN system institutionalized LGBT activism in a close and contentious vote on the establishment of a UN independent expert on violence and discrimination on the basis of sexual orientation and gender identity last December. It was done over the objections of nearly half the members of the General Assembly, who now deny the legitimacy of this mandate. In January the newly appointed expert met with the UN system to make sure the UN bureaucracy is on board with the LGBT agenda. Last summer he published a report that misrepresented international law and the positions of countries opposed to his mandate. In December he was replaced. Pro-lifers are used to abortion and population control advocates like Paul Ehrlich saying the most outrageous and inhuman things. But they were deeply troubled when they heard them at a conference in the Vatican this year. Two Vatican conferences drew attention to human population numbers as a problem, something unthinkable a few years ago. Sadly, the validation of population control advocates at the Vatican coincides with the rapid resurgence of population control as a tool to achieve sustainable development in UN debates. Tags: Stefano Gennarini, J.D., C-Fam, 2017, UN, United nations, worst moments, Human Life, Family To share or post to your site, click on "Post Link". Please mention / link to the Greater Fitchburg For Life. Thanks! A doctor has been charged with the premeditated killing of his 17-week-old preborn son after he allegedly spiked his girlfriend’s drink with an abortion pill earlier this year. He is being held in jail before his trial in March 2018. The doctor is internist Sikander Imran, who moved to Arlington, Virginia from Rochester, New York either upon learning or shortly before learning his girlfriend Brooke Fiske was pregnant. In Virginia, Imran allegedly put 800 milligrams of the abortion drug misoprostol in Fiske's tea. She said she discovered a “gritty substance” at the bottom of the cup. “I could tell that it was a pill that had been ground up,” she told WROC. Fiske experienced contractions and Imran “immediately started crying and said that he was a horrible person and that he had done what I thought he did,” she recalled. Fiske was rushed to Virginia Hospital Center, where she delivered a dead baby boy. killing unborn baby, spiked, girlfrined, dring, abortion pill To share or post to your site, click on "Post Link". Please mention / link to the Greater Fitchburg For Life. Thanks! Legal abortion contributes to a fifty percent increased risk of premature death in women, according to a new systematic review that examined 989 studies of deaths associated with pregnancy outcomes. 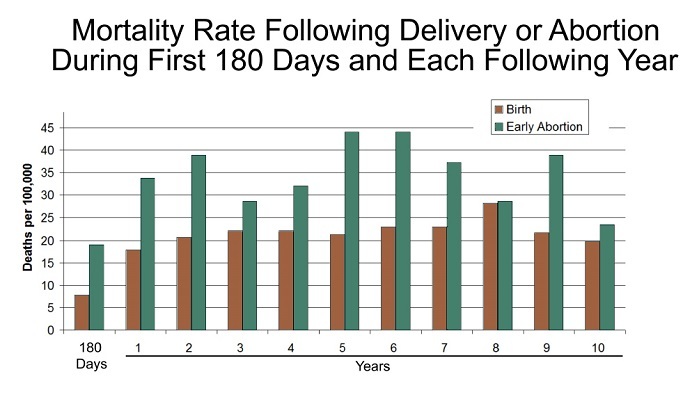 Within the first 180 days, the risk of death from any cause is over twice as high following abortion compared to that following delivery. The risk of early death remains elevated for at least ten years (Figure 1). Both abortion and miscarriage are linked to elevated mortality rates, but the effect is more strongly associated with induced abortions. 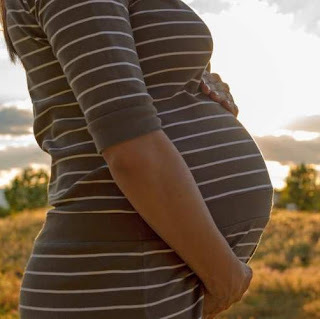 The largest portion of premature deaths following pregnancy loss are due to suicides, accidents, homicides, and some natural causes, such as circulatory disease, which are known to be associated with stress. 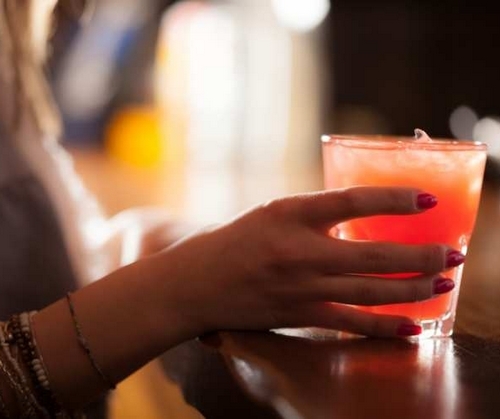 The reviewers concluded that these findings are best explained by the psychological effects of pregnancy loss, which contribute to elevated levels of stress, substance abuse, risk taking, and self-destructive behaviors. The studies reviewed also reveal a dose effect, with each exposure to abortion adding approximately a 50 percent increased risk of premature death compared to women who have never had abortions (Figure 2). . . . Tags: New Study Reports,Each Abortion, Increases Woman’s Risk, Premature Death by 50% To share or post to your site, click on "Post Link". Please mention / link to the Greater Fitchburg For Life. Thanks! Liberal political correctness has gone wild at the University of Minnesota and officials at one of the biggest universities in the United States are essentially banning Christmas. Not only that, any colors or themes or “icons” that may possible be associated with Christmas are banned as well. Even jolly ole Santa Claus gets the boot. University of Minnesota officials recently distributed a document titled, “Religious Diversity and the Holidays,” to employees and student workers advising them to keep “inappropriate religious celebrations” out of public spaces. The document was distributed at the University as part of a “Dean’s Dialogues: Respecting Religious Diversity in CFANS and at the University” event within the College of Food, Agricultural and Natural Resource Sciences. Employees and student workers were also encouraged to report a bias incident of “inappropriate religious celebrations in their work or learning environment” to the Office of Equal Opportunity and Affirmative Action. Tags: University of Minnesota, Memo Proposes, Banning Christmas, Prohibiting Celebrations With Nativity Scenes, Angels or Santa Claus To share or post to your site, click on "Post Link". Please mention / link to the Greater Fitchburg For Life. Thanks! 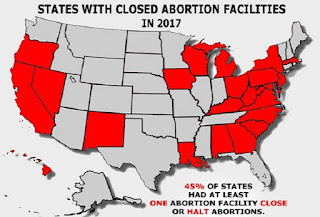 In a year that abortion businesses attempted to expand in America, the actual number of abortion facilities decreased by 27 clinics over 2016 totals. 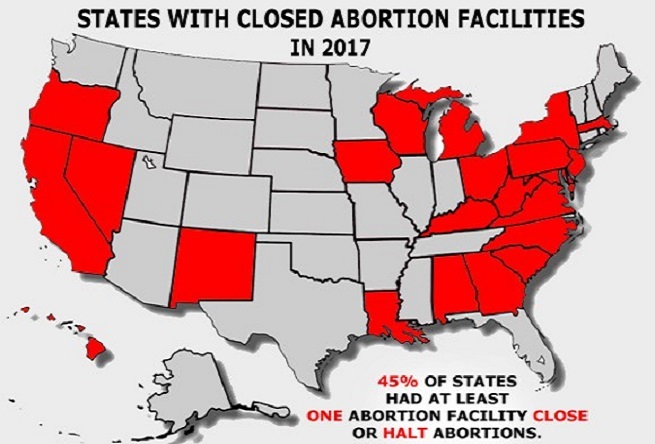 Closures far outpaced newly opened abortion facilities in 2017. In all, 49 abortion facilities — 35 surgical and 14 medication only clinics — closed or halted abortion services. Only eight new surgical abortion facilities were opened, along with eleven new medication abortion facilities. Tags: 49 Abortion Clinics, Closed in 2017, 77% of All Abortion Clinics Open in 1991, Have Shut Down To share or post to your site, click on "Post Link". Please mention / link to the Greater Fitchburg For Life. Thanks! ACLU wants US Gov’t to Facilitate Ilegal Immigrant Abortions . . .
. . . . Trump admin fights back! The American Civil Liberties Union (ACLU) and the Trump administration are again fighting in court over whether the U.S. government should be forced to facilitate abortions for pregnant illegal immigrant minors. On Friday, the ACLU asked a federal judge to allow two minors in U.S. custody, “Jane Roe” and “Jane Poe,” to abort their babies. It’s unclear in what state or states they are located. Jane Poe “is quickly approaching the limit for abortion in the state where she is being detained,” according to the lawsuit. In October 2017, the ACLU and the Trump administration’s Department of Health and Human Services (HHS) fought over whether a 17-year-old illegal immigrant minor, “Jane Doe,” should be allowed to abort her baby. HHS had provided the teen in its care with life-affirming resources. After a brief legal battle for the baby’s life, on October 24, the D.C. Circuit Court of Appeals ruled 6-3 the teen was to be allowed to abort her baby. On October 25, the ACLU announced the 16-week-old baby had been aborted. The U.S. Department of Justice is now asking the U.S. Supreme Court to punish the ACLU for lying about the timeline of this abortion. Tags: ACLU,wants US Gov’t, to Facilitate, Ilegal Immigrant, Abortions To share or post to your site, click on "Post Link". Please mention / link to the Greater Fitchburg For Life. Thanks! 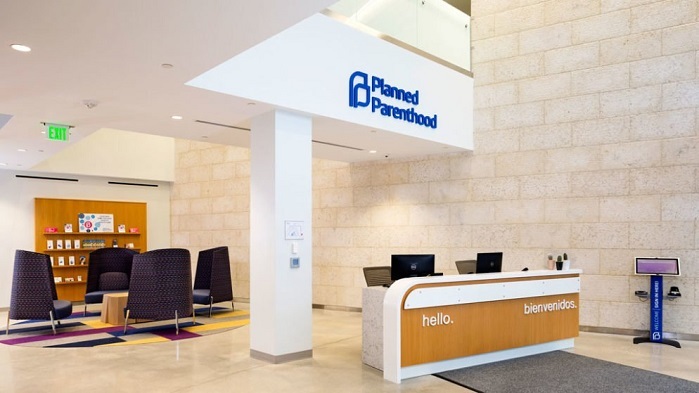 by Penna Dexter, Contributing Author: States across the nation have been redirecting taxpayer dollars away from Planned Parenthood and toward health clinics that do not offer abortions. It’s time for the federal government to do the same. And the US Justice Department may now provide strong justification. 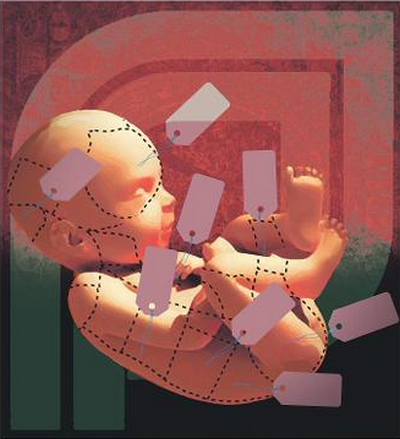 Prompted by David Daleiden’s investigations into Planned Parenthood’s baby-parts-for-profits transactions, two congressional committees have been looking into the activities of Planned Parenthood related to the sale of human body parts. Last year a House panel released its report and made 15 criminal referrals against certain organizations, including Planned Parenthood, universities, and fetal tissue companies. Now, the Senate Judiciary Committee has released a report showing evidence that Planned Parenthood has indeed violated federal law in selling organs derived from babies they have aborted. The Committee issued criminal referrals to the Department of Justice and the DOJ is taking this seriously. It’s not illegal to provide body parts for research. But it is illegal to make a profit from selling them. Planned Parenthood charged and received payment from Stem Express and other companies that facilitate the transfer of body parts to research institutions. Planned Parenthood claimed the bulk of these charges were reimbursements for shipping costs. But the Senate Judiciary Committee found that Stem Express paid the shipping costs for these transactions. The Committee has the receipts to prove it. The Department of Justice now has these receipts and has requested additional unredacted material from the Judiciary Committee’s investigation. Now that the DOJ is officially investigating Planned Parenthood for criminal activity, there’s no reason for Congress to continue to send the organization $500 million annually. Congress should take the next opportunity to completely and permanently halt the flow of dollars to Planned Parenthood. Tags: Penna Dexter,Viewpoints, Point of View, investigating, Planned Parenthood To share or post to your site, click on "Post Link". Please mention / link to the Greater Fitchburg For Life. Thanks! U.S. House Speaker Paul Ryan is taking some heat this week for encouraging families to have more children. Ryan made the comment Thursday while discussing the problems caused by an increasingly elderly population and low birth rates. These issues have government leaders throughout the world concerned about the future of their economies, their increasingly elderly citizens and more.
. . . A 2012 United Nations study made similar predictions. It warned that the “most serious impact of aging populations would be in developing countries without safety nets or adequate legal protection in place for older people,” and pushed for reforms of Social Security-type programs and “national pensions” for the elderly. “Informal support systems for older persons are increasingly coming under stress, as a consequence, among others, of lower fertility, out-migration of the young, and women working outside the home,” the UN report states. 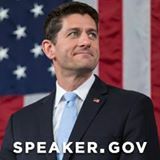 Tags: Speaker Paul Ryan, Underpopulation is Causing Financial Problems, ,People Need to Have More Babies, To share or post to your site, click on "Post Link". Please mention / link to the Greater Fitchburg For Life. Thanks! Choice. It’s a word that Planned Parenthood loves to use when promoting the killing of unborn babies in abortions. But now, the abortion chain is abandoning its favorite word in an underhanded attempt to force Christians to pay for birth control, including methods that may cause abortions, in their employee health plans. Crystal Strait, president of Planned Parenthood Affiliates of California, recently wrote an opinion piece for The Sacramento Bee to argue their case. Strait blasted President Donald Trump’s administration for rolling back President Barack Obama’s birth control mandate. The onerous requirement forced groups like the nuns of Little Sisters of the Poor and the religious owners of Hobby Lobby to challenge the mandate to the U.S. Supreme Court, or face crippling fines. Trump provided relief from the Obamacare mandate by granting wider exceptions to religious groups, but several state attorneys general are challenging the decision. Strait praised pro-abortion California Attorney General Xavier Becerra for being one of them. “We believe that denying access to contraception is both illegal and immoral. Thanks to the ACA’s birth control benefit, 55 million women gained access to contraception,” she wrote. . . .
. . . The new Trump administration rules give wider exceptions to religious objectors who have been forced to pay for contraception, including methods that may cause abortions, under the Obamacare mandate. The Trump administration says the new rules are motivated by “our desire to bring to a close the more than five years of litigation” over the pro-abortion mandate. These include cases by the Little Sister of the Poor, Hobby Lobby and countless other religious organizations and businesses. Tags: Planned Parenthood, says, Christians Should be Forced, to Fund Abortions, It’s “Immoral” Not To To share or post to your site, click on "Post Link". Please mention / link to the Greater Fitchburg For Life. Thanks! Why Would Christians Go Christmas Caroling Outside an Abortion Clinic? A young woman sits in the waiting room of American Women’s Medical Center on Chicago’s northwest side, waiting to be called back to the operating room for her procedure. Even now, she’s unsure about the choice she’s made. She knows that abortion is against her religion, but she feels cornered. This is the only way out. As the rest of the carolers move off to their cars to head to the next stop on their caroling tour, an experienced counselor stays behind to talk to the young woman about her situation. She gives her the number for a nearby pro-life pregnancy center that can help her with prenatal care, housing, getting plugged into social services, and anything else she might need. 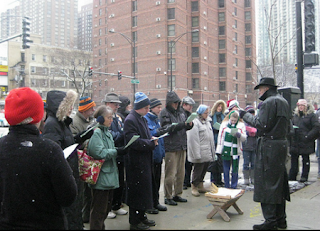 This Christmas miracle took place on a Saturday morning in December 2003, the year the Pro-Life Action League organized our first Christmas caroling tour at abortion facilities throughout Chicago. We soon began training other pro-life groups to hold “Peace in the Womb” Christmas caroling tours in their own communities, and they were soon reporting back to us with their own stories of mothers being moved to cancel their abortions. This year, Christmas carols will be sung at close to 100 abortion facilities throughout the country. It is especially sorrowful that a child would be aborted at this time of year—a horrible contradiction of the Christmas story of hope and joy dawning upon the earth with the birth of a baby. Those of us who go out every year to sing Christmas carols outside abortion centers draw parallels between the story of Bethlehem and so many of those sitting in abortion waiting rooms right now—the poor and displaced who have found “no room at the inn,” and in desperation are turning to abortion. 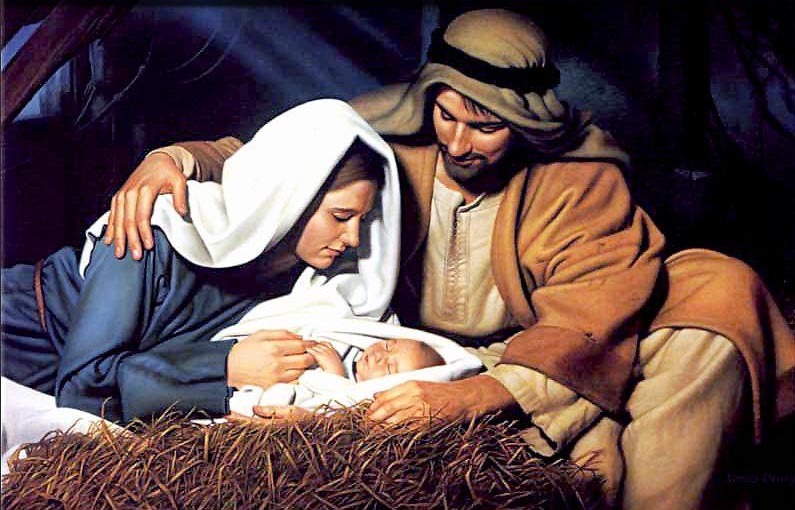 We know that from the “pro-choice” perspective, abortion would be the ideal solution for a couple in Mary and Joseph’s situation, with their scandalous “unplanned” pregnancy. Planned Parenthood would have aborted Jesus. The child spared from abortion during our inaugural caroling tour in 2003 will soon celebrate his or her 14th Christmas. I don’t know if this teen knows that a Christmas carol saved his or her life, but I’m sure that for the mother, “Silent Night” has become very special, a reminder of the joyful day that she, like Mary, said “Yes” to being a mother. What if she instead had gone through with that abortion? It’s heartbreaking to think of all the women—and men—for whom carols like “Silent Night” and all the other trappings of the Christmas season will forever be a reminder of abortion. Tags: Why, Christians, Go Christmas Caroling, Outside, Abortion Clinic To share or post to your site, click on "Post Link". Please mention / link to the Greater Fitchburg For Life. Thanks! David Daleiden and the Center for Medical Progress (CMP) announced Wednesday that they are filing a new motion in the Ninth Circuit Court of Appeals to request the removal of Judge William Orrick in the lawsuit brought against them by Planned Parenthood, pointing to his ties to Planned Parenthood. According to Daleiden’s petition, Judge Orrick has “an ongoing and longstanding professional relationship with one of the named Plaintiffs.” Orrick is a founder and officer of the Good Samaritan Family Resource Center (GSFRC), an organization that partners with Planned Parenthood and had a Planned Parenthood clinic incorporated on its premises while Orrick served as secretary and counsel to the organization. “Judge Orrick is part of the Planned Parenthood family,” Daleiden told reporters on a press call Wednesday. Daleiden and his lawyers say Orrick and his wife assisted in getting a Planned Parenthood clinic at GSFRC while they served there. 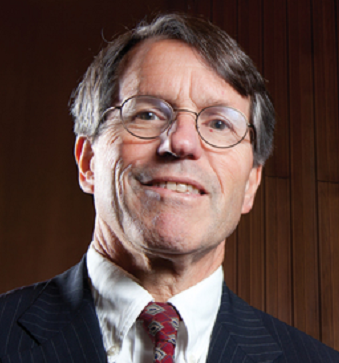 “Judge Orrick’s image has been deployed repeatedly online in support of terrible statements referring to the CMP videos as ‘domestic terrorism,’ literally ‘domestic terrorism,'” said Peter Breen of the Thomas More Society, the pro-life legal group representing Daleiden and CMP. Daleiden petitioned the Supreme Court in August to remove a gag order that Judge Orrick issued barring CMP from releasing additional undercover footage. blocked videos, exposing aborted baby parts, To share or post to your site, click on "Post Link". Please mention / link to the Greater Fitchburg For Life. Thanks! Tags: Brian Smith, Fitchberg, MA, news, Knights of Colubus, Holiday Newsletter To share or post to your site, click on "Post Link". Please mention / link to the Greater Fitchburg For Life. Thanks! by Tony Perkins: When it comes to advertising on the D.C. metro, free speech is in for a bumpy ride. In a classic case of viewpoint discrimination, a federal judge is siding with the Washington Metropolitan Area Transit Authority (WMATA) for turning down ad space to the Catholic Church. WMATA defended the move by saying it bans "religious, political, or advocacy" messages (depending on who's defining them, apparently, since the Human Rights Campaign still enjoys a prominent space in the subway's line-up). Even so, the Archdiocese of Washington complains, nothing about their message was overtly spiritual. The scene is three wise men, two sheep, and a sky of stars with the words "Find the perfect gift" in the center. As a spokesman for the church complained, "The advertisement does not seek to address a general, otherwise permissible topic from a religious perspective. The sole purpose of directing the public to FindThePerfectGift.org is to promote religion [there]." Interestingly enough, the city's policy was adopted to stop an ongoing debate about Islam from taking place on WMATA's posters. But in stopping Muslim speech, it silenced everyone else's. The censorship has gone so far that an unlikely alliance has already formed between groups like the Archdiocese, ACLU, PETA, and even a local abortion clinic, who all insist that D.C. officials have gone too far. Metro's guidelines are "establish[ing] a regime that is hostile to religion," Catholic officials protest. Besides, the Archdiocese argues, where do you draw the line between what's "religious" and what isn't? If metro allows posters for the Salvation Army or a yoga studio, which both have religious overtones, what's the problem with a Christmas scene? Still, Judge Amy Berman Jackson insists the city is well within its rights. 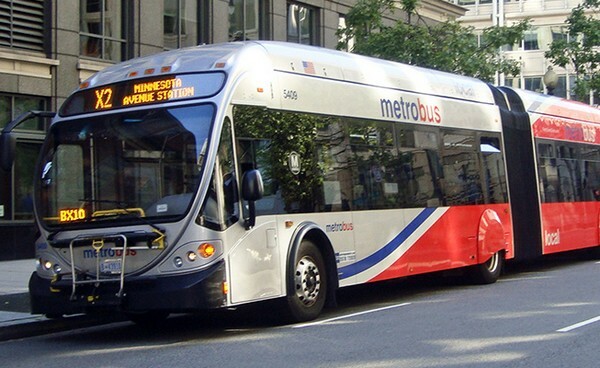 "The regulation is reasonably aligned with WMATA's duty to provide safe, reliable transportation, and it does not violate the First Amendment." Which Constitution is she reading? Of course it does. In a broad net like this, everyone's rights get trampled. Like most people, I think it's dangerous to limit expression. We shouldn't be afraid of open debate, especially on something as harmless as Christmas. "We should be especially wary of the government restrictions on one's viewpoint," FRC's Travis Weber warns. They are the most dangerous at their core and go to the heart of why we have the First Amendment. In ruling for WMATA here, the court let the government rely on administrative convenience and the avoidance of controversy as a legitimate basis to exclude ads... But suppressing a message for fear of the response is the essence of the heckler's veto, and is no way for a free country to act. If, for no other reason, this is perhaps why the courts should be inclined to rule for the Archdiocese and be loath to affirm any policy which could be used to justify views the government doesn't like. "Conservatives don't have to fear the lies because we have the truth. But how do you defeat a lie if you can't speak the truth? Unless WMATA changes its policy, I guess we're about to find out. Tags: Archdiocese of Washington, Christmas message, Christmas, advertisement, denied, Washington Metropolitan Area Transit Authority To share or post to your site, click on "Post Link". Please mention / link to the Greater Fitchburg For Life. Thanks! For some reason, people on the left have repeatedly found it to be acceptable to mock White House Press Secretary Sarah Huckabee Sanders for her looks. The LA Times was forced to delete part of a column that referred to Sanders as a “slightly chunky soccer mom,” among other things, and the author apologized. . . ."
And then there’s Chelsea Handler. A feminist @GovMikeHuckabee is someone who supports other women. A feminist is someone who believes the accounts of 15 different women who have similar stories about our President. A feminist doesn’t discount other women. Your daughter is not a feminist. You raised a liar. Tags: Chelsea Handler, Has New Insult, For Pro-Life White, House Spokeswoman, Sarah Sanders To share or post to your site, click on "Post Link". Please mention / link to the Greater Fitchburg For Life. Thanks! 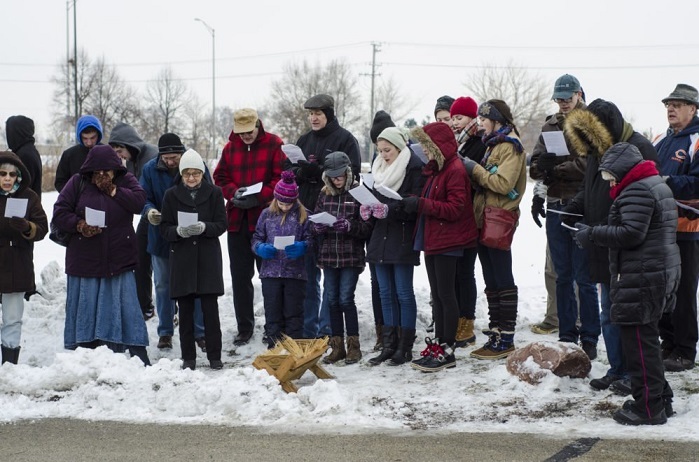 More than 70 pro-life groups across the county are calling for “Peace in the Womb” this year with Christmas carols outside facilities that offer abortions. A few groups have already started the caroling, with a group in Glendale, Arizona gathering outside the Planned Parenthood facility this past weekend. The Pro-Life Action League has sponsored the event for 15 years. . . .
. . . According to azcentral.com, Lisa Blevins, a Glendale event organizer, said the groups sing carols to remind women thinking about abortion that the “salvation of the world came through an unplanned pregnancy.” . . . Tags: Pro-Life People, Will Sing, Christmas Carols, Outside Local Abortion Clinics To share or post to your site, click on "Post Link". Please mention / link to the Greater Fitchburg For Life. Thanks! The abortion chain Planned Parenthood will argue against a Texas law Monday that requires its abortion facilities to bury or cremate aborted babies’ remains. The law, which passed in June, helps to ensure that aborted babies’ bodies are not sold and are treated with dignity and respect. It requires that abortion facilities, hospitals and other health clinics to bury or cremate the remains of aborted and miscarried babies. Planned Parenthood and other abortion advocacy groups lobbied against the bill, but the legislature passed it with strong support. Abortion activists have not given up the fight. On Monday, Planned Parenthood is scheduled to argue against the law at a hearing in front of the Texas Health and Human Services Commission, Spectrum News reports. 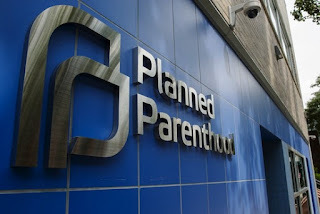 Planned Parenthood, the largest abortion chain in the United States, claims the law threatens women’s health and safety and makes it harder for them to abort their unborn babies, according to the report. More specifically, they claim the cost of cremating or burying the aborted babies creates an undue burden on women’s access to abortion. Tags: Planned Parenthood, Challenges Texas Law, Requiring Proper Burial, Aborted Babies To share or post to your site, click on "Post Link". Please mention / link to the Greater Fitchburg For Life. Thanks! “At this point, the records are intended for investigative use only—we understand that a resolution from the Senate may be required if the Department were to use any of the unredacted materials in a formal legal proceeding, such as a grand jury,” said Justice Department Assistant Attorney General for Legislative Affairs Stephen Boyd. Tags: Planned Parenthood, May Finally Be Held Accountable, for Selling Aborted Baby Parts To share or post to your site, click on "Post Link". Please mention / link to the Greater Fitchburg For Life. Thanks! by Tim Brahm: Imagine you’re out hiking with a friend in the beautiful (and fictional) country of Florin, as depicted in The Princess Bride. You’re both clueless tourists but you’ve casually looked at some maps and you think you can handle yourselves. As you’re walking by a ravine, your friend points to a group of trees and says, “Hey, I think if we wander down the ravine and into those trees, we’ll save some time!” You agree, but start to get worried as you notice that what started out as a beautiful forest has turned into a terrifying swamp. Ten minutes later, you are both killed by Rodents of Unusual Size. Now imagine an alternative scenario. Unlike your tourist friend, you’re a native to Florin, so you know about the parts of the country to avoid, such as the Fire Swamp. When your clueless friend suggests wandering into a dangerous area, you casually redirect him, and you both survive. A conversation about abortion is surprisingly similar. There are plenty of useful topics to discuss, and plenty of tangents that, while they won’t cause you to get eaten, are really not a good use of time. Some unhelpful tangents come up regularly because they’re fairly natural responses to some of the arguments I regularly use, and I have learned from experience that some of them should just always be avoided. This post is about a simple but effective way to avoid one in particular. Imagine we’re hanging out at the zoo. We’re having a great time in front of the elephant exhibit, when a crazy gunman runs in and starts shooting. He gets six shots off before he is tackled by security. The first bullet kills the world’s unluckiest cockroach, the second bullet kills a squirrel, the third bullet kills the elephant, and the other three bullets kill three humans: a newborn, a toddler, and an adult woman. Here’s the question: how many of these killings should be considered murder? If the thing that makes you a person is having any level of sentience, then that would mean it’s just as wrong to kill a squirrel as it is to kill a human, because they’re both sentient. If the thing that makes you a person is having a more advanced ability like self-awareness, then that would mean it isn’t wrong to kill the newborn, because it isn’t self-aware yet. What do you think? But sometimes the pro-choice person instead tries to direct our conversation into the unproductive hell of debating the validity of intuition by asking, “Well, how do you really know that it’s wrong to kill newborns?” Sometimes they’re just being stubborn, but other times they’re honestly just doing their best to externally process and understand their own views. The key to avoiding this Fire Swamp of a tangent is to ask them to be consistent instead of claiming to have knowledge. I absolutely believe that I have knowledge that it’s wrong to kill newborns, but it’s too complicated to defend that, and, in this case, it’s unnecessary. If they ask, “Well, how do you really know that it’s wrong to kill newborns?”, I just respond by saying, “That’s a complicated question. I’m just asking you to be consistent. Do you really think it isn’t wrong to kill newborns?” They almost always admit that they don’t think that, even if they can’t give a bulletproof defense for why. Carl: Well, how do we really know? Some people would say that it is just as wrong to kill a squirrel as it is to kill a human. Tim: Yeah, but would you say that? Tim: Then that pro-choice view isn’t an option for you. If you aren’t willing to bite that bullet, you can’t say that sentience is the thing that makes us equal. Carl: Yeah, that makes sense. Tim: If she has the right to do anything she wants with anything inside her body, then shouldn’t she have the right to intentionally deform her baby? Carl: Well, who knows, some people might say she should have that right. Tim: Yeah, but would you? Tim: Then you can’t justify abortion by saying that a woman can do anything she wants with anything inside her body. I could have followed Carl down the tangents of whether we really “know” those things, but it would have been completely unnecessary. Carl wasn’t actually open to biting those bullets, but he had a moment of curiosity that could have derailed our conversation if I hadn’t kept us on track. Around an hour later, Carl changed his mind about abortion, and that would not have happened if I’d let him get distracted by an interesting, but ultimately irrelevant question. Your time in a conversation about abortion is a precious, limited resource, so spend it wisely. Tags: Tim Brahm, How to Have, Productive Conversation, About Abortion, With Someone, To share or post to your site, click on "Post Link". Please mention / link to the Greater Fitchburg For Life. Thanks! 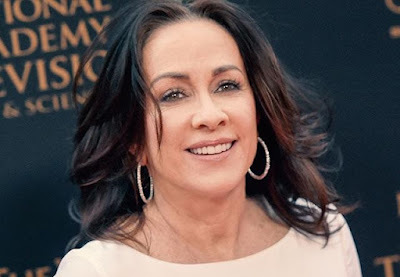 Known for starring in “The Middle” and “Everybody Loves Raymond,” Heaton recently wrote a column for America Magazine about the discriminatory targeting of unborn babies with Down syndrome for abortion. Heaton, who is active on Twitter, said the impetus for her writing was a CBS News tweet in August about Iceland nearly eliminating Down syndrome. Eliminate, Down Syndrome, To share or post to your site, click on "Post Link". Please mention / link to the Greater Fitchburg For Life. Thanks! Franken’s resignation was first reported by CNN shortly before Franken’s speech. On Wednesday evening, Minnesota Public Radio said that Franken would resign, but Franken denied this at the time. Immediately after announcing his resignation, Franken immediately pivoted to saying that it was a shame that he was resigning while President Donald Trump, who himself was accused of sexual misconduct, was still the president. Franken said that his decision to resign was not based around him, but rather for the people of Minnesota. 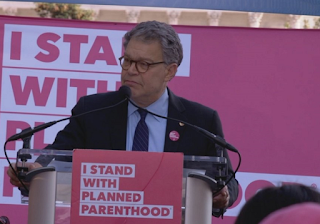 Tags: Pro-Abortion, Sen Al Franken, Won’t Resign for Weeks, Blamed Trump Instead To share or post to your site, click on "Post Link". Please mention / link to the Greater Fitchburg For Life. Thanks! Helping Women Doesn’t Mean Advocating Abortion. Quite the Opposite! This November, member nations of the “Group of 7” (G-7) met in Italy to discuss current global health issues and challenges. To the outrage of abortion activists, the G-7 members landed on language that omits abortion terms under the “Gender Perspective in Health Policies and Rights for Women, Children and Adolescents” section of the communique. Instead, the language states that G-7 nations—made up of the U.S., Canada, France, Germany, Italy, Japan and the U.K.—would pay special attention to the health of mothers, newborns and children with evidence-based interventions to address issues like mortality and violence. “The U.S. proposed compromise language during negotiations asking to qualify the term ‘sexual and reproductive health’ by reference to UN agreements that explicitly deny abortion is an international right. In the end, it was negotiators from Canada and Europe who wanted no mention at all of ‘sexual and reproductive health,’ preferring deletion to qualifying the term to exclude abortion rights. This is likely to upset proponents of “She Decides”, a movement created in response to U.S. President Donald Trump’s reinstatement of the Mexico City Policy earlier this year, which influenced the policies proposed by the U.S. at the G-7 meeting. “She Decides” was started by Lilianne Ploumen, the Dutch Minister of Foreign Trade and International Development. On its website, the group asks visitors to sign a misinformed manifesto—one that curiously fails to point out that abortion mandates such as China’s “One-Child Policy,” not a lack of abortion access—lead directly to coerced abortions and the loss of choice. Contrary to what “She Decides” and others claim about the devastating effects to women, the Mexico City Policy does not reduce the money the U.S. invests in global health; it simply redistributes where the money will go—which includes the numerous women’s health centers that give comprehensive care without performing abortions. Again in contrast to much of the hype, the majority of Americans agree with this approach. According to a Marist Poll earlier this year, 83 percent of Americans oppose using tax dollars to support abortion in other countries. What’s more, the G-7 communique also addresses those issues by stating that the nations commit to address sexual and gender-based violence such as child and forced marriage, female genital mutilation, human trafficking and exploitation. Tags: Helping Women, Doesn’t Mean, Advocating Abortion, Quite the Opposite! To share or post to your site, click on "Post Link". Please mention / link to the Greater Fitchburg For Life. Thanks! 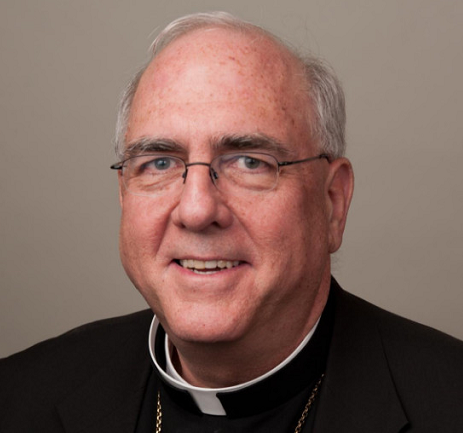 Tags: Archbishop Slams, Pro-Choice Catholics, Calls on Priests, Preach More Pro-Life Homilies To share or post to your site, click on "Post Link". Please mention / link to the Greater Fitchburg For Life. Thanks! The Chairman of the Federal Communications Commission has excoriated the social media platform Twitter for censoring pro-life posts and other social conservative viewpoints. 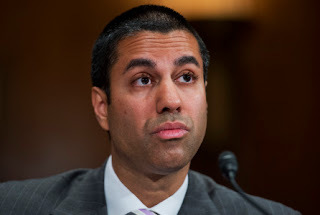 FCC Chairman Ajit Pai says that Twitter is employing a “double standard” in blocking conservative content while leaving liberal messaging untouched. Pai pointed to a recent incident in which Twitter took down a pro-life advertisement from Tennessee Congresswoman Marsha Blackburn. Blackburn had posted an advertisement for the launch of her campaign for the U.S. Senate. Representative Blackburn’s ad touted her leadership in exposing Planned Parenthood’s marketing and sale of the body parts of aborted preborn children. Tags: FCC Chairman, Blasts Twitter, Censoring Tweets, Pro-Life Groups To share or post to your site, click on "Post Link". Please mention / link to the Greater Fitchburg For Life. Thanks! Attorneys general in 11 states urged the U.S. Supreme Court on Monday to vacate a lower court’s decision to force the government to help facilitate an abortion for an illegal immigrant minor. The teen, “Jane Doe,” aborted her unborn baby in October after a federal appeals court ruled in her favor. However, the federal government and the 11 states want the high court to consider the case because of the precedent it could set for future situations. Earlier this fall, the ACLU won a victory for the abortion industry when a federal appeals court ruled that the government must help facilitate an abortion for the teen who was staying in a Texas government shelter. Barely 24 hours after the ruling, the teen had her unborn baby aborted. Later, the Trump administration accused the ACLU of deceiving the government about when the teen’s abortion would take place. It asked the Supreme Court to consider the case, as well as disciplinary actions against the ACLU attorneys. The Dallas Morning News reports Texas Attorney General Ken Paxton filed a brief Monday, along with attorneys general in 10 other states, supporting the federal government’s case. 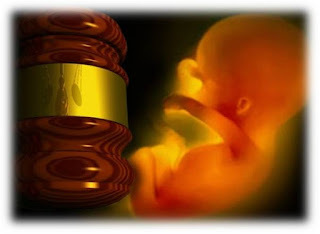 Tags: 11 States, Tell Supreme Court, We Have a Right, to Protect Unborn Babies, From Abortion To share or post to your site, click on "Post Link". Please mention / link to the Greater Fitchburg For Life. Thanks! Which brings us to a sympathy bouquet of flowers masking as a news story that appeared in the Springfield (Mo.) News-Leader. What is Schmitt talking about? Some frivolous requirement with no real purpose? Hardly. Unlike other state health departments, Missouri’s health department takes seriously its responsibilities to pass rules to enforce state laws. NRL News Today has written a passel of stories about Missouri’s omnibus SB 5 law passed during a special session of the legislature last summer. As is almost always the case, the state passes pro-life legislation, Planned Parenthood challenges it in court. In SB 5 Planned Parenthood has, so to speak, a target-rich environment. Planned Parenthood (through Schmitt) in this instance is bemoaning a regulation [referred to as the “Complications Plan Requirement”] that mandates when an abortion “provider” performs chemical abortions, they have a written agreement with an obstetrician-gynecologist who has admitting privileges at a hospital in case of emergencies. Randall Williams, the director of the Missouri Department of Health and Senior Services defended the regulations, Schmitt reported. Tags: Planned Parenthood,Complains It Costs Too Much Money, to Get Women, an OBGYN After Botched Abortion To share or post to your site, click on "Post Link". Please mention / link to the Greater Fitchburg For Life. Thanks! 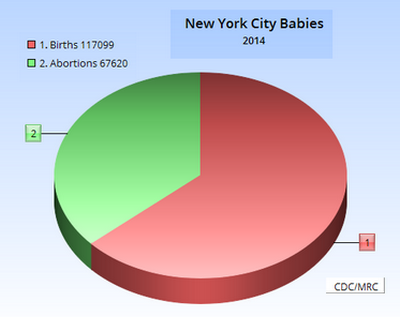 One of every three babies is aborted in New York City – a third of all the new lives conceived in the Five Boroughs. Seems newsworthy, but don’t expect to hear that number from the networks. The day after Thanksgiving, the Centers for Disease Control and Prevention (CDC) released its most recent Abortion Surveillance report, revealing U.S. abortion data for the year of 2014. For the pro-life movement, 2014 symbolizes the year after the conviction of abortionist Kermit Gosnell and the year before the Center for Medical Progress released its Planned Parenthood tapes. According to the CDC, a “total of 652,639 abortions were reported” for 2014 by 47 states, New York City and the District of Columbia. 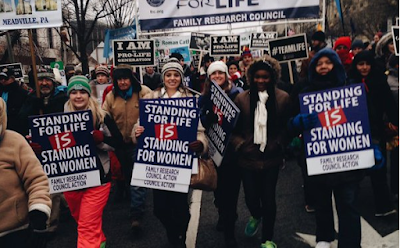 That number happily represented a 2% decrease in abortion from last year’s 2013 report. Like last year, three states – California, Maryland and New Hampshire – refused to participate. But other news was more somber. As in 2013, the highest abortion rate, in comparison to the birth rate, came from the most populated U.S. city. In 2014, New York City boasted the highest abortion rate – 34.8 abortions for every 1,000 women of reproductive age (15-44) – and the highest abortion ratio – 575 abortions for every 1,000 live births. With a total of 67,620 abortions, that means the city had approximately 117,600 births, according to CDC numbers. New York State’s Department of Health reported 117,099 births. That translates into a total of 184,719 babies (born and aborted) for the city in 2014. That means more than one in three babies are aborted in New York City, and its abortion rate is more than 1/2 of its birth rate. No other state or area listed had an abortion ratio that came close. After New York City, Florida followed with an abortion ratio of 328 abortions for every 1,000 births. Tags: Shocking, New York City, Figures Show, More Than 1 in 3 Babies, Killed in Abortions To share or post to your site, click on "Post Link". Please mention / link to the Greater Fitchburg For Life. Thanks!